Many cat owners may not realize the long term effects that declawing can have on their pet's wellbeing. Declawing, or onychectomy, requires completely amputating the last bone on every toe of the cat because the claw grows from that bone. If you leave a fragment of that bone, the claw will regrow, often in a deformed way that leads to infections and lameness years after the surgery. Many people who had cats declawed in the past had no idea that bones were being amputated or the potential for long-term pain and suffering. There is also an increase in behavioral problems, which can be very difficult to treat. Many cats stop using the litterbox after surgery and start eliminating on soft objects like rugs, sofas or beds, which tends to be a lifelong problem and often leads to the abandonment of the cat. Some cats do seem to increase biting behavior after surgery as well. 1) If you have a kitten, you can acclimate them to nail trims early on. 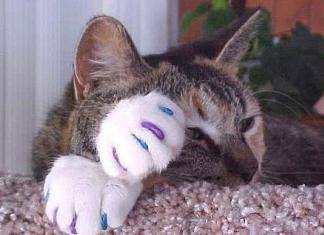 Adult cats can usually also learn to tolerate nail trims, but it can take longer. 2) Be sure your cat has appropriate scratching surfaces where your kitty can scratch freely. 3) Keep areas you don’t want scratched such as the arm of a sofa, temporarily covered with plastic or double-sided tape to deter scratching while the cat learns to use the post. 4) Consider nail caps as these can work well too.